very nice house to live in not only in the summer but also in the winter, thanks to its exposure to the south, the house become very couchy, the fireplace adds a new vision for home. In the Summer despite its proximity to the city, it is very calm and peaceful. Village of Salema is very natural with a nice beach ,is a place fishers mens a very special place for stay !! suite - Bathroom with bath and separate shower and 2 washbasins and wc. Bathroom 2 - 2 washbasins and bath. Bathroom 3 - a washbasin and a wc. Bathroom from 1st floor (near living room) - wc + washbasin. Large living/dining room (55 sq.m.) with wood burning fire, 2 maples, a support table, TV, satelit, DVD and a dining table, exit to a nice terrace. Fridge, microwave, washing machine (cloth and dishes), toaster, coffee machine and cooker etc. Parque de Floresta Golf Course 2km (5 minutes) drive from the house. Notes on accommodation: Pets only with previous agreement. 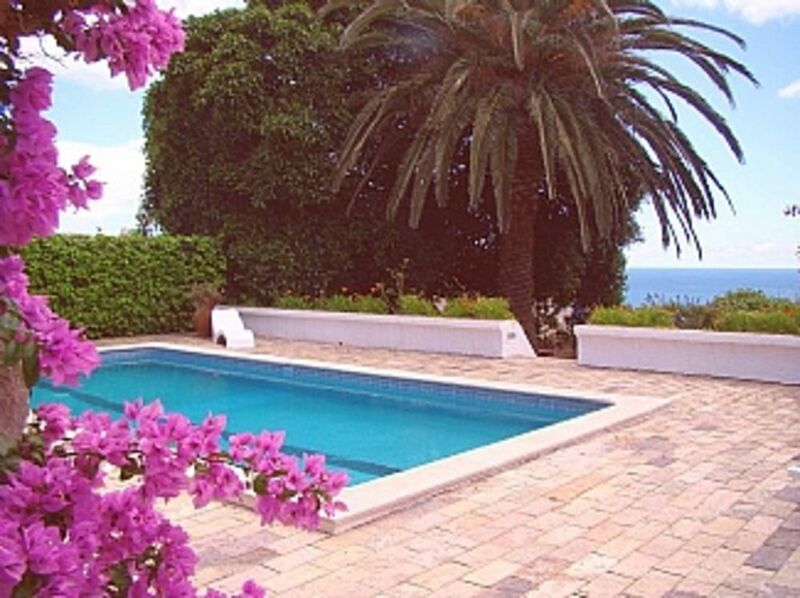 Outside: Very nice and large garden with sea view, barbecue, outdoor furniture, private pool with privacy. Cleaning / Towels / Linen / Maid service: Towels and linen are inclued. Maid every week (included in the price) the cleaning end have a cost,depends of the number the persons, please enquire for more days make a requirement (paying). This is a brilliant place. Amazing views, lots of spaces to relax and hang out, garden and pool - it felt very private, but it is not at all isolated. The flowers are so beautiful - the colours are extraordinary - it really is lovely. Everything worked and was really comfortable - loads of towels - including beach towels! Five mins walk (steep steps) to a great fun beach - blue sea, sand, waves and families having a good time. Salema is a small resort - not over polished or over packed. Its got everything you need - tiny, well stocked supermarket, bakery, easy going restaurants - for all pockets. Lurdes was lovely to deal with - everything went smoothly. A great holiday. The Villa Trafalgar is the ideal place for spending very nice and relaxed holidays with a family in Salema. The beach is just 5 minutes walk and good walks are possible both inland from the house or along the coast. The area is still relatively unspoilt being in a Natural Park. Salema is only 5 mins walk from the house and provides all the day to day necessities as well as a reasonable selection of restaurants. There is an Ecomarche supermarket at Budens (3kms from the house). Lagos is the nearest big town and is 15-20 minutes drive away.